Top golfing instructor Jim McLean shares the secret to a better swing and a better gameIt's what every great golfer knows and every struggling player wants to know: how to find ""the slot,"" the perfect channel through which the shaft and club head can meet the ball on the downswing for a more powerful, accurate, and consistent swing.Great ball-strikers like Ben Hogan, Sam Snead, and Jack Nicklaus were slot swingers. Today, Tiger Woods, Sergio Garcia and Jim Furyk provide dramatic examples. 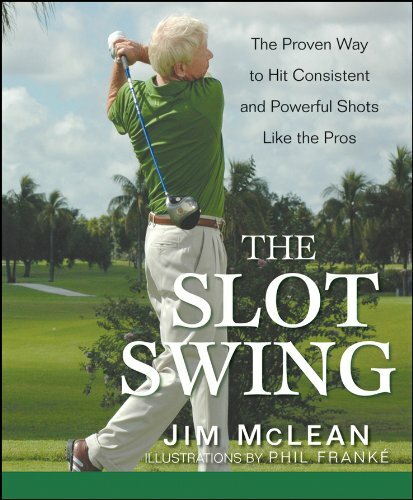 Now leading golf instructor Jim McLean shows you how to find the slot to take your game to the next level. With step-by-step instructions and more than eighty illustrations by leading golf illustrator Phil Franke, The Slot Swing makes it easy.Shows you how to find the perfect channel for a more powerful and consistent swingShares McLean's secrets from more than twenty years as a top instructor to the greatest prosFeatures stunning two-color art by Phil Franke and a full-color foldout showing how the dramatically different swings of Tiger Woods, Sergio Garcia, Bruce Lietzke and Jim Furyk all end up in the slotWritten by the author of the classic book The 8-Step Swing, named one of the 20th Century's top 15 golf instructionals by Sports IllustratedThis book helps you get out of a golfing rut, get locked in to your slot, and find the sweet spot in your game. Top golfing instructor Jim McLean shares the secret to a better swing and a better gameIt's what every great golfer knows and every struggling player wants to know: how to find "the slot," the perfect channel through which the shaft and club head can meet the ball on the downswing for a more powerful, accurate, and consistent swing.Great ball-strikers like Ben Hogan, Sam Snead, and Jack Nicklaus were slot swingers. Today, Tiger Woods, Sergio Garcia and Jim Furyk provide dramatic examples. Now leading golf instructor Jim McLean shows you how to find the slot to take your game to the next level. With step-by-step instructions and more than eighty illustrations by leading golf illustrator Phil Franke, The Slot Swing makes it easy.Shows you how to find the perfect channel for a more powerful and consistent swingShares McLean's secrets from more than twenty years as a top instructor to the greatest prosFeatures stunning two-color art by Phil Franke and a full-color foldout showing how the dramatically different swings of Tiger Woods, Sergio Garcia, Bruce Lietzke and Jim Furyk all end up in the slotWritten by the author of the classic book The 8-Step Swing, named one of the 20th Century's top 15 golf instructionals by Sports IllustratedThis book helps you get out of a golfing rut, get locked in to your slot, and find the sweet spot in your game.